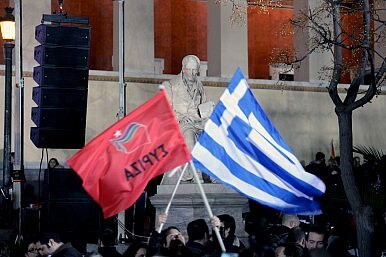 Supporters of Greece's Syriza party wave the Greek and Syriza party flags. Though China has been largely silent, the specter of a ‘Grexit’ is deeply troubling to Beijing’s financial plans. The Chinese government, beyond benignly supportive comments, has mostly kept silent on the Eurozone travails and the on-again, off again saga of a potential Greek exit from the Euro in recent weeks. This silence has tended to be China’s default in recent years. In 2009, when the European Stabilization Fund was established after the first signs of volatility and structural problems in the Eurozone, its newly appointed director made a quick trip to Beijing. Rightly or wrongly, media speculation honed in on the possibility of him asking the foreign exchange-rich Chinese government whether they might be able to contribute. If he did make such a request, he came back empty-handed. When asked how Europe should tackle its problems, Wen Jiabao, then China’s premier, simply commented that he was sure the leaders of European countries had the wisdom and foresight to deal with their current issues. It would be interesting to ask him now – six years after he made this comment – whether he still stands by it. Despite this, in quieter ways the Chinese did try to show some practical support. High level visits to Greece in 2010, headed by current Politburo Standing Committee member Zhang Dejiang, led to China taking an interest in Greek ports, shipping companies, and other assets. Premier Li Keqiang visited Greece in June last year reiterating this support, and only a few weeks ago Li stated he wanted to see Greece stay in the Euro. Even in 2010, there was grand talk of the country being China’s gateway to Europe, and part of the Silk Road. These days, however, China seems to have found a number of other gateways, just in case passing through this one becomes too problematic. There are larger strategic reasons why, despite its historic preference for disunity within the EU on issues that matter to it (like policy on Taiwan, Tibet and human rights), China is keen to see the strongest possible European Union on a matter like this. It’s not that China has any deep love of the European project to forge political unity in a region where, through much of modern history, fractiousness and deadly enmity have so often tragically played a role. Beijing is more concerned with the fiscal stability of this region, which, despite all the challenges since the Great Financial Crisis of 2008, still matters and is important to China. One reason for China’s concern is the alternative Eurobonds offer to dollar-denominated U.S. treasury bonds. Most know that China has accrued a staggering $4 trillion or more of foreign exchange reserves, one of the most noticeable results of its non-convertible currency. While it is estimated that two-thirds of these holdings are in U.S. dollars, about a quarter is in Euro-denominated Eurobonds. This is not an issue of China seeking more profits. Neither U.S. treasuries nor Eurobonds offer high yields. Instead, as economist David Steinberg argues in an excellent chapter on China’s foreign reserves in The Great Wall of Money (Cornell, 2014), in many ways these investments are a monument to cautiousness and indecisiveness within the Chinese domestic decision-making elite rather than any great sign of a Chinese gambit for economic global hegemony. The one things these bonds offer are security and relative stability — at least until now. China’s dependence on U.S. economic performance and its currency has been an increasing irritant. High level officials like Zhou Xiaochuan, governor of the People’s Bank of China, have been arguing for over five years that there needs to be a global currency separate from the dollar. Despite this, greenbacks still constitute the closest the world has to a global currency. Chinese attempts to spread use of the RMB for trade settlement through bilateral swap deals are moderate and largely tactical. They constitute less than 1 percent of international trade flows. Chinese economists, cautious or not, have eyed the Eurobond for a number of years as a possible alternative. None regard it as remotely close to replacing the U.S. treasuries, but at least they see it as another basket into which they can put a few eggs. Seeing so much uncertainty in the EU and the Eurozone now will not serve their interests. Very ironically, the Chinese government is an ally of European unity here. Its interest converge with policymakers and politicians in Brussels trying to salvage the Eurozone from Greece’s potential hasty exit. The question is whether, in this area that risks so directly affecting China’s material interests, it is willing, or even able, to do anything politically or economically to defend these interests. And the second question is whether Europe would allow China to become heavily involved. With the announcement of a a new bailout deal for Greece, these questions may be moot — for the time being. But they eventually will need to be answered.